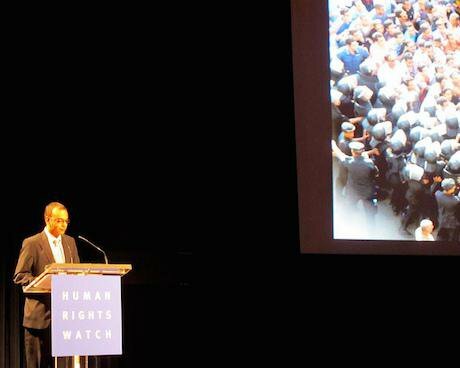 Hossam Bahgat receiving Human Rights Watch's annual award. Flickr/EIPR. Some rights reserved.Journalist and human rights activist Hossam Bahgat is scheduled to face military prosecution on Wednesday for investigating a secret military trial in mid-October. On Monday, the military prosecution ordered the detention of Bahgat for four days pending investigations into charges of “publishing false information that harms national security" and “publishing information that endangers public well-being”, accusations often used to legally prosecute journalists and writers. Bahgat’s reports “threaten military security”, stated military spokesman Mohamed Samir. He is being prosecuted under Article 102 (bis) and Article 188 of the Penal Code, Samir said. Bahgat is detained at an unknown location, lawyer and human rights activist Negad El-Borai said. “Most probably he is with [military] intelligence,” said Borai. Bahgat’s latest investigation, ‘A coup busted?’, delved into the military trial of 26 officers accused of plotting to overthrow the current regime in coordination with the Muslim Brotherhood. “In Egypt, it is forbidden to discuss the military, despite the absence of a law which stipulates this,” said lawyer Mohamed ElBaqqar. Bahgat’s defence was that the investigation is professional and devoid of any personal opinion, based on the case documents, the court ruling and interviews with the accused officers’ families, said ElBaqqar. “Most of the cases related to media are politicised”, ElBaqqar stated. The constitution prohibits detention for publication cases, said journalist Khaled ElBalshy. “Bahgat’s detention is alarming,” he declared. The state is sending a message to the media that it will not tolerate opposition of the regime in any way, said Ragia Omran, human rights lawyer and co-founder of the No Military Trials for Civilians group. The arrest comes shortly after President Abdel Fattah Al-Sisi’s speech at the beginning of November in which he condemned media criticism of him. “This is a crackdown on media in various ways,” Omran said. The state is also trying to distract people from the Russian plane crash incident and the emergency situation in Alexandria and other governorates severely affected by rain, Omran said. Bahgat, an investigative reporter at Mada Masr independent news website, was summoned by military intelligence for questioning on Thursday. The summons he received at his home in Alexandria gave no reasons. He arrived at military intelligence headquarters in Cairo at 9am on Sunday. Ten hours later Bahgat was transferred to military prosecution to be interrogated. Bahgat founded local NGO the Egyptian Initiative for Personal Rights (EIPR) in 2002 and directed it until 2013. He was a visiting scholar at Columbia Journalism School in the U.S. from 2014 to 2015. A recipient of Human Rights Watch's Alison Des Forges Award in 2011, Bahgat’s recent work also includes looking into the ‘Arab Sharkas cell’ case, for which six were hanged in May following military prosecution. His article, ‘Who let the jihadis out?’ investigated those responsible for the pardon of Islamists post-2011. “The Egyptian military cannot continue to consider itself above the law and immune from criticism,” said Philip Luther, Director of the Middle East and North Africa Programme at Amnesty International, in a statement released by Amnesty on Sunday. The statement continues that the arrest “is a clear signal of the Egyptian authorities’ resolve to continue with their ferocious onslaught against independent journalism and civil society”. The US State Department announced that they have seen news reports concerning the arrest, and are “closely following” the case. The United Nations Secretary-General, Ban Ki Moon, expressed “concern” over the detention of Bahgat, who is a member of UNDP's Global Civil Society Advisory Council. “This is just the latest in a series of detentions of human rights defenders and others that are profoundly worrying to the Secretary-General,” stated the UN on Monday. Sixty-two journalists are currently in Egyptian prisons, according to the Arabic Network for Human Rights Information (ANHRI). ANHRI was among the organisations calling on the Egyptian authorities to release Bahgat and to drop accusations pressed against him. The Committee to Protect Journalists (CPJ) also called for his release, counting 18 journalists behind bars. “Egypt has used arrests, legislation, and threats in an attempt to control the media and prevent independent reporting, particularly on matters of security and terrorism,” the CPJ said on Sunday.